DESCRIPTION: Reinforced EPDM Membrane with Butyl Peel/Stick Connection. Used for EPDM perimeter and edge terminations. INSTALLATION PROCESS: SEE DATA SHEET FOR DETAILED INSTRUCTIONS. 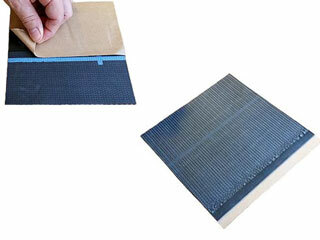 Base Membrane - Black EPDM, 0.045"
Adhesive: Black Butyl Adhesive, 0.035". Packaging: Rolled with silicone release paper.